Arguably the most well known textile in the United States is the flag. The definitive patriotic symbol, it immediately evokes a reaction from all who see it. 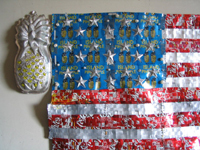 For our Independence Day show, we offer eight internationally acclaimed artists who re-construct or deconstruct the American Flag. From glorious to political, from pop images to sensual installations, they salute our national symbol with voices that speak of pride, but also disappointment and betrayal. Ultimately they all build on this iconic imagery and lead the viewer into new territory. Jane Ingram Allen celebrates the reverence for our national symbol and glorifies its presence in her site specific flags. 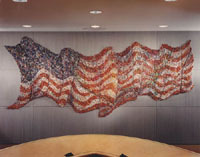 Jane Ingram Allen reveres the beauty of our national symbol and glorifies its presence in her many site specific, commissioned flags. 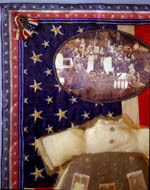 The Saratoga flag was created as a collaborative project and is comprised of many flags made by individual participants. 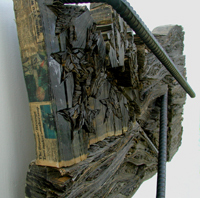 Jim Bassler’s “Soiled” is a painful commentary on the state of the nation. 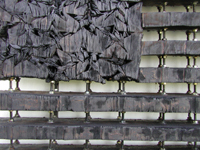 Likewise Kate Hunt’s burnt flag emotes a sense of loss. Both pieces are hauntingly beautiful yet beg a dialogue for recovery and repair in order to reach the promise of hope. Second- hand garments (288 pieces) comprise Bill Will’s room size installation. Ironically the result is only a 7% American-made Flag giving us a clear commentary on the economic reality of outsourcing products. Stuart Wagner and Dawn Beecher fashion their flags from cultural detritus. Fun, certainly, but they also speak of socio/economic and political issues such as obesity, dependency on oil, and overwrought mass consumerism. Kate Anderson uses the teapot as sculptural armature for her visual message. Pop icons within the canon of fine art are recreated using traditional knotting techniques thus blurring the boundaries between art and craft. Lucy Feller'spieces define a personal history yet evoke a familiar nostalgia. She glories in the photographic process as much as in the outcome. 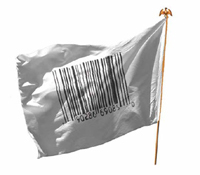 The flag is a loaded symbol; the artists in our show are not denigrating the object but rather using it as a known entity to clarify their conceptual statements. Devotion to country goes hand in hand with political activism. We invite you to reflect on the flag this Independence Day. Resin over aluminum, bottle caps and f/0. 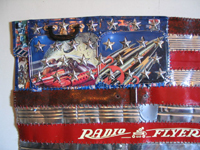 Woven and punched metals of a Radio Flyer wagon, aluminum and lunch box. 10.25 x 9.5 x 2.5"
10.75 x 9.5 x 2.75"
9.5 x 10.5 x 3"
Mixed media, antique dress, vintage photographs, american flags, buttons, ribbon with NY Tribune dated from 1863. Photographic panels of children during the civil war. 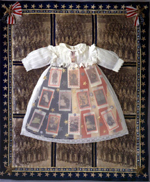 antique child's dress, ribbons, buttons, metal stars, photos of civil war soldiers at drill, photos of children from the civil war to the turn of the century. 35" x 36" x 4"
antique child's dress with overlay of silk organza, buttons, rhinestones, ribbons and braid, photos of children from the turn of the century. 28 x 42 x 3"
vintage doll's gingham dress, small American flags, rosettes, metal stars, buttons, photos of children from the turn of the century. 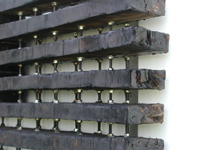 18.5 x 13 x 21.5"